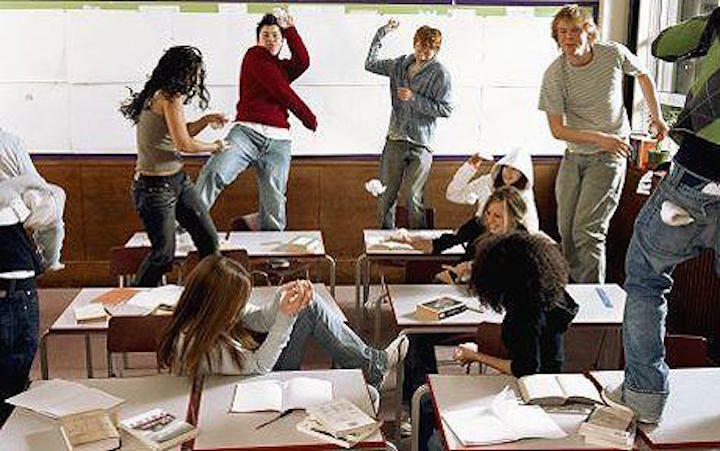 7 Ways To Annoy Your Teacher Without Getting In Trouble. Some of us have had that teacher that loves to come to school just to get YOU in trouble. They hate their life, so they figure they will make you suffer for it the entire day. Well, here’s an opportunity to be as much of a pain in their side as they are in yours. 1. Walk into class just as the bell rings. Not one minute before or a second after, so technically you’re not late and the teacher can’t give you a tardy, but you walk in at the exact moment the bell rings, which is sure to annoy your teacher. 2. Drop your textbook. Make sure it’s an especially large textbook, but don’t make it too obvious. For instance, while you are writing, you could “accidentally” shift your wrist too fast and knock the textbook on the floor, creating a loud and satisfying thump. It looks like a complete accident, you can’t possibly get in trouble. 3. Raise your hand to answer a question and then say “never mind” when you’re called on. This one is especially irritating, because the teacher can’t blame you for trying to answer a question, right? Do this at least a couple times a day. 5. Cough or sneeze loudly and constantly. If a teacher asks you to stop, say you can’t because you have a health problem. Only do this if you can make it sound realistic, otherwise they will pick up on it. 6. Fake a computer freeze. This one only works if you use a computer or laptop in class. Ask your teacher to come help you because your computer is frozen, even though it’s not. When they come over say, “Sorry, I guess it’s working now.” It’s best to do this when your teacher is at the other side of the room, resulting in a long walk across the class for nothing. 7. Tell a story. When the teacher asks if the class has any questions, raise your hand and offer a comment. Tell a long, drawnout, and not necessarily true but boring story about something that only partially relates to the subject. StraightStoned.com – One Of The Best Satirical News Sites I’ve Seen In A Long Time!